It is the time of year where we all make ( and break ) our New Year resolutions. I wish everyone a very safe and Happy New Year ! After the first glass, you see things as you wish they were. After the second, you see things as they are not. Finally you see things as they really are, which is the most horrible thing in the world. It all began for the Sazerac cocktail in the early 1800’s when Antoine Amedee Peychaud mixed Cognac with his Peychaud bitters. 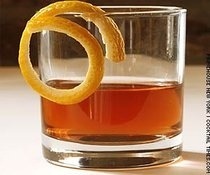 In 1859 the drink was the signature drink of the Sazerac Coffee House in New Orleans, where it received its name. The exact reason for the substitution of rye whiskey for the Cognac is unclear, but the whiskey base is used today. Chill an old-fashioned glass by filling it with ice and letting it sit while preparing the rest of the drink. In a separate mixing glass, muddle the simple syrup and Peychaud bitters together. Add the rye whiskey and ice to the bitters mixture and stir. Discard the ice in the chilled glass and rinse it with absinthe by pouring a small amount into the glass, swirling it around and discarding the liquid. Strain the whiskey mixture from the mixing glass into the old fashioned glass. Garnish with a lemon twist. Traditionalists will say that the lemon twist should be squeezed over the drink to release its essences but that the twist should not be dropped into the glass itself.